1: The Road To Madison Square Garden. An exclusive documentary featuring new interviews with Eric and Steve, together with rare footage and photographs of Cream, Traffic and Blind Faith. 2: Rambling On My Mind. The final preparation for the three legendary performances highlighted by an acoustic soundtrack performance by Eric of the Robert Johnson standard "Rambling On My Mind"
3: Bonus. Madison Square Garden Performances of "Lowdown", "Kind Hearted Woman" and "Crossroads"
This re-pairing of two of rock musics most respected & revered musicians has been a long time coming, but for 3 nights late last year, their respective schedules had sufficient gaps to allow time for this reunion to finally take place-decades after their initial teaming up in Blind Faith-one of the first supergroups of the late sixties. 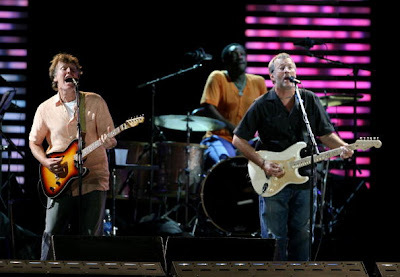 Although Winwood did appear at Clapton's Crossroads guitar festival in 2007, the timing wasn't initially right for a proper organized reunion, but it did whet the appetites of both Clapton & Winwood to agree to sit down & work out just when their timing would allow more time for a tour. And thank bloody god these two get along! Unlike the often tenuous & tempestuous relationship that EC has with the other 2/3rds of Cream (Jack Bruce & Ginger Baker) his relationship with Steve Winwood was always much healthier by comparison-musically as well as personally! 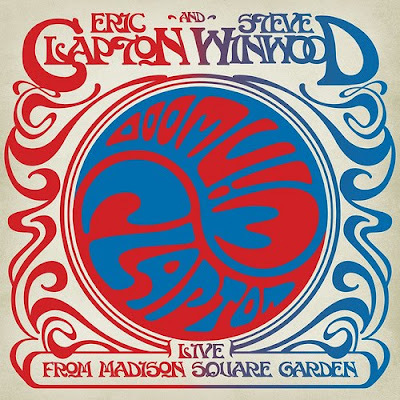 This point is made because it is readily apparent that Clapton & Winwood just feed off each magnificently-their playing is totally in sync with both-the demands of the music-and the stylistic differences between each other. But the key reasons why this particular concert is so much fun to watch is the passion, energy, enthusiasm & sheer joy these two grizzled gods display so effortlessly. They are having a ball feeding off each other without doubt, so it makes you wonder just why it didn't happen sooner! Presumably they felt this way as well, because checking out their respective websites, they are teaming up again for a full tour proper. And more fans will be able to appreciate this great opportunity in person. But, this being the digital age, thank god for DVD (and Blu-Ray!). This for me, has being one of the best things about DVD, the fact that so many musical acts are now recorded for posterity via this wonderful medium. And its not just the newer acts that have cashed on this, many older more established artists have found this option an attractive idea as well. This point is even more pertinent when you factor in that many of these musicians from rocks past are getting older-and dying. So, if you can't attend the concert in person, the next best thing is to buy a DVD of the tour. And probably you'll have a better seat-and viewpoint as well! But the really cool thing is that you can replay this concert again, and again, and...again!